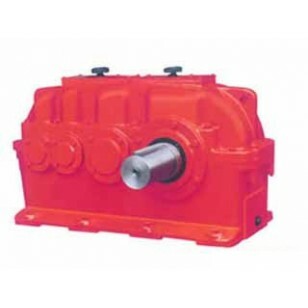 This product is an outer meshed involute helical tooth cylindrical gear speed reducer. It is widely applied to the fields of metallurgy, mines, hoisting, transportation, cement, architecture, chemical, textile, printing and dyeing, pharmaceutical, etc. 3.The temperature of work environment should be -40-45℃. If below 0℃, before start, the lubricating oil should be pre-heated to above 0℃. This speed reducer can be run at clockwise and counterclockwise direction. D expresses a single stage , L expresses grade-two , S expresses grade-three , Y indicates that adopt the hard flank of a tooth gear wheel.